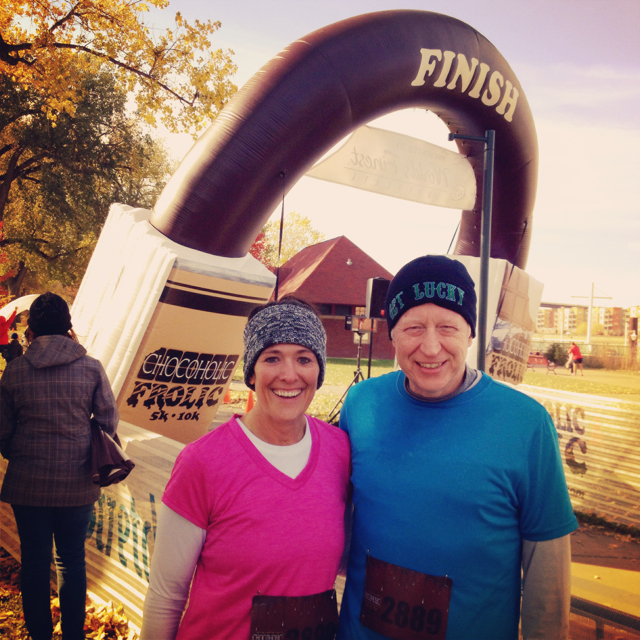 Last weekend, my husband and I participated in our first-ever Chocoholic Frolic race. We opted for the 10K, which is 6.2 miles. I found out about this race after seeing a billboard for it along Interstate 94. I also think a few friends told me about it, but apparently I didn’t really pay attention to them. For some reason, that billboard made me take notice and check into the race, which is put on by Final Stretch. 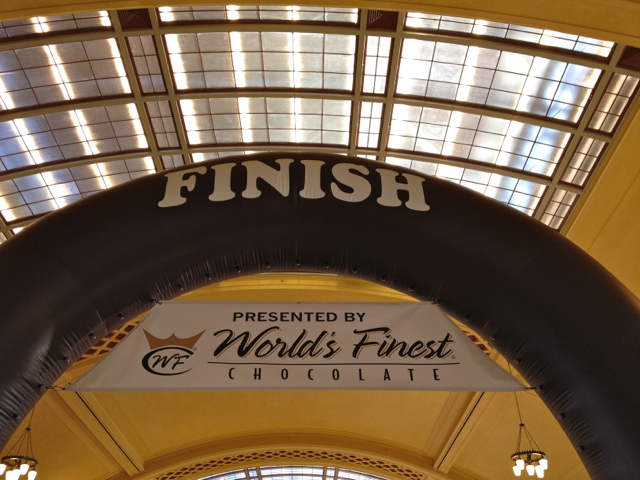 The them of the race, of course, was chocolate, as it was sponsored by World’s Finest Chocolates, among other sponsors. Besides what you would normally find in your race goodie bag, such as your bib number, flyers for other races, pins and possible shirt, our chocolate-colored goodie bag also contained chocolates. Yes, they were yummy. Here’s a few chocolate-themed pics from the event. 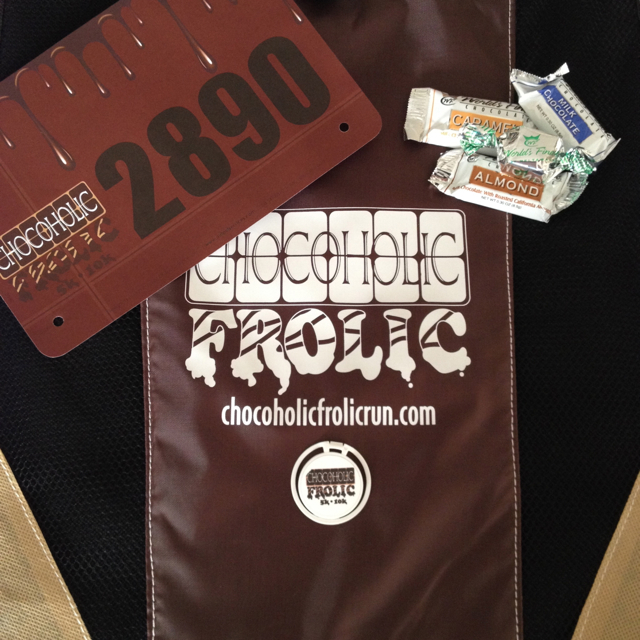 Our goodie, the chocolates and my bib number. The “finish line” at the race expo on Saturday. This was directly above the World’s Finest Chocolate booth, which is of course, where we picked up a few more chocolates! Another sign at the expo. There were plenty of more, but I only took the time to capture these two. I was kind of bummed when we were walking about the expo as there was a cupcake booth, which was supposed to have samples of cupcakes. They were gone by the time we got there…an hour after the expo started! Apparently the company didn’t realize just how much runners like cupcakes, chocolate cupcakes! The starting line for the 10K race. 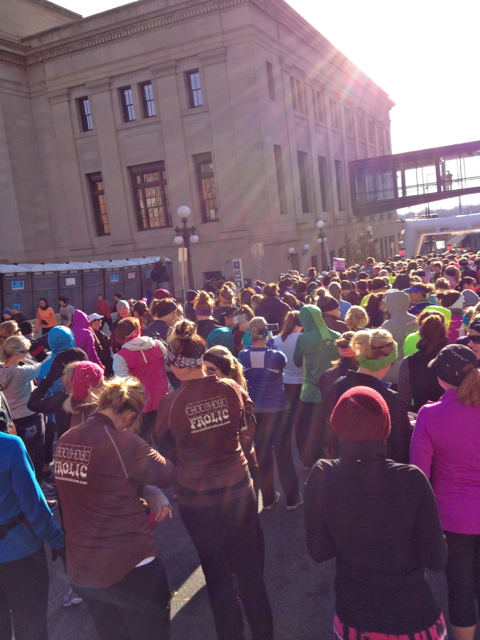 Notice the two women in brown shirts – these were the shirts we received with our registration. They are awesome! And here we are at the finish line, which yes, is falling down! Sunday, which was race day, was an especially windy day! As we were getting our photo taken (as usual, by a random stranger! ), a big gust came up and started blowing down the inflatable finish line. Luckily, it didn’t blow completely down as there were still runners coming across. Al finished the 6.2 mile run in 50:55 and I finished in 1:02:46. Despite the wind and the VERY hilly start, we were both pleased with our times. And, we both said this was one of the most prettier courses we’ve ran. For those of you in the St. Paul area who are looking for a pretty route, check out this link to the map. It seriously was gorgeous! 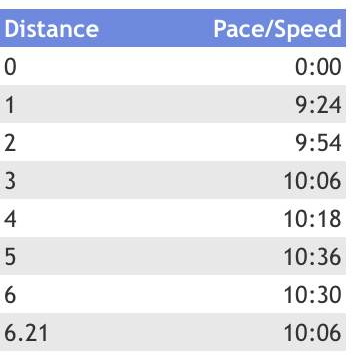 Here’s a look at my splits…yes, I started WAY too fast (for me). Surprising, considering the first half-mile was all up hill! Oh, and by the way, the “issue/problem” I talked about in my last blog post, surfaced near the end, but wasn’t nearly as bad as the half-marathon or the 10-mile Monster Dash. And, to let everyone know, YES, I made a doctor appointment. I go in November 19. I’ll keep you all posted. Thank you, by the way, to those who responded via message, FB message, email or in person. I appreciate your thoughts and concern. So, as if the chocolate we received in our bags and at the expo wasn’t enough, there was chocolate along the route as well. Around mile 2, there were chocolate cupcakes and around mile 4, there were chocolate candy pieces or something. 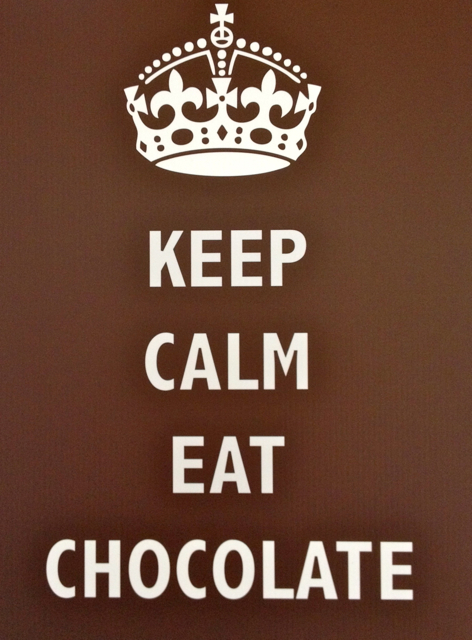 Believe it or not, I DID NOT indulge in any of the chocolate along the route. 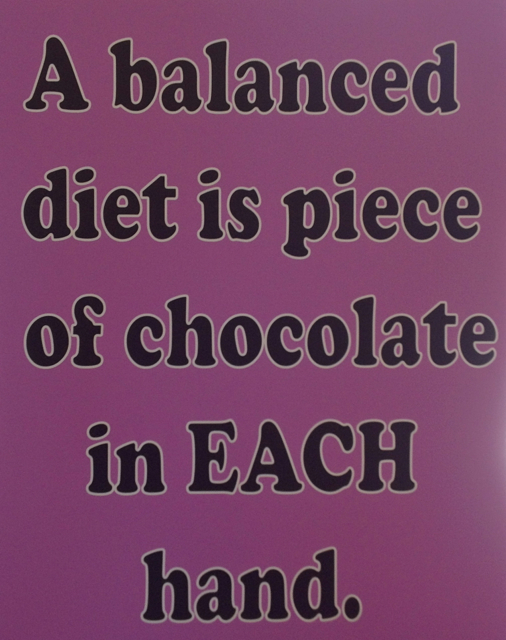 As much as I LOVE chocolate, it just didn’t sound appealing to me as I was running. And if that chocolate wasn’t enough, there was even more chocolate…we each received a chocolate caramel “finisher’s bar” at the end of the race. That is what they handed out instead of medals. Now that the weather has gotten slightly colder and we have less and less daylight, my hubby and I have found we are spending more time at the YMCA. AND………I tried something I said I hated doing and that I would never do. 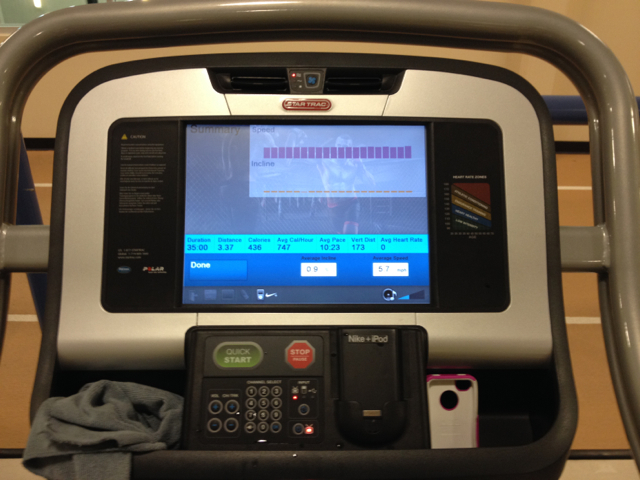 THE TREADMILL! Yes, I ran on the treadmill. And, more than once already. And…..it’s not THAT BAD! I guess. Previous Previous post: 10-miler, medical tent, misc stuff and LOTS of food!